So I'm in a packaging class and each week we have a different challenge - like project runway. You can see what we've been doing here but I had to post this because it just makes me laugh. 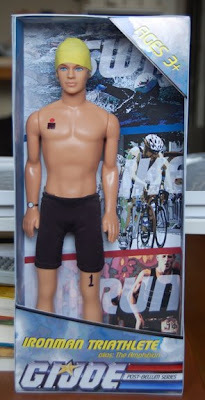 We had to "re-brand" either Barbie or GI Joe - you know, make a new version of the doll that hasn't been done yet. I was assigned GI Joe and I don't know about you, but have you ever seen how freakin' violent those toys are? Anyway, I wound up using Ken and just called him GI Joe - he's THE AMPHIBIAN - the Ironman Triathlete for the new Post-Bellum line of GI Joes. The series would continue with Tour De France Joe, Mt. Everest Scaling Joe, Scuba Joe, Michael Phelps Joe...you get the idea. I just giggled to myself the whole time i was making him. His swim cap is the thumb of a rubber glove. And he has a bike too - I haven't downloaded the pics from my camera yet... more to come. You should totally pitch this to WTC and Hasbro. You will be RICH!!! poke poke. let's toss around race ideas for next year. because I have nothing better to do than plan my life a year in advance. That is freaking awesome. Showed some of the guys in my office and they think so too.